The headline to this post was going to be “My Own Private Readathon” but I couldn’t resist typing “My Own Private Idaho”. I haven’t seen that film since it first came out back in 1991. 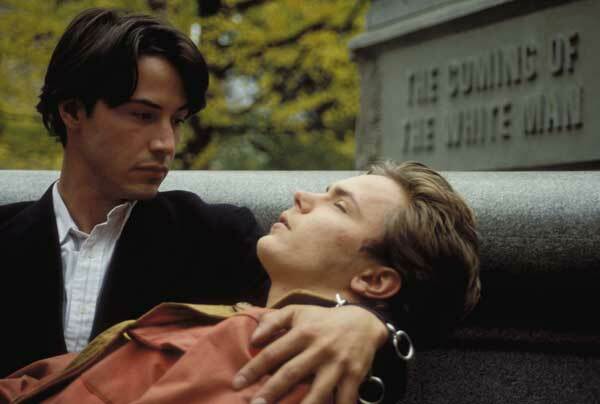 I don’t remember a lot about it except that both Keanu Reeves and River Phoenix were in a film with a gayish theme. So what does this have to do with a readathon? Nothing. But c’mon weren’t they cute? I’ve decided that next weekend is going to be an all weekend readathon for me. I am not going to stay up all night or anything crazy like that. I just want to focus on reading. With the cavalcade of guests and home improvements since mid-March, I just want to put my feet up and do nothing but read. Laughing out loud. Enjoy the reading weekend. Yum. I know everyone makes fun of Keanu, but he's so cute in that pic. Enjoy reading weekend. This post also reminded me of the B52's song of the same name. I don't remember the movie, but I love your reading weekend idea. Enjoy! I tried to make yesterday a reading day…and wasn't very successful. I think I do my best reading when I am supposed to be doing something else! Good luck and I look forward to reading your reviews of all you read over the weekend. What a great idea Thomas. I often see people joining in with various readathons… after the event, and then kick myself. I never think of just letting myself have one of these weekends. I think I might do just that this weekend myself too. Frances: I just couldn't resist. Plus when was the last time you saw a post about My Own Private Idaho? Picky Girl: You are so right. When Keanu looks good, he looks really good. Martine: I need to watch it again. Ti: Maybe there is a connection. Susan: It requires a supportive family to clear the decks for reading time. Ruthiella: I seem to have the same problem. There are mornings where my commute can't be long enough because I want to keep reading. And then other mornings, let's say waiting for a doc appointment when I have tons of time to read and can't quite get in the mood. Simon: I am starting to think it may not happen this weekend. I just remembered I have a work event on Saturday morning that may ruin my reading mojo.